The Art of the Brick – The streams are crossing! The Powerhouse is hosting a the World premier of the “greatest LEGO exhibition in the Universe” – The Art of the Brick: DC Comics. Calling all super heroes and super villains: TheArt of the Brick: DC Comics will have its worldwide premiere on 21 November 2015 at Powerhouse Museum, Sydney – the exclusive Australian venue for this exhibition. 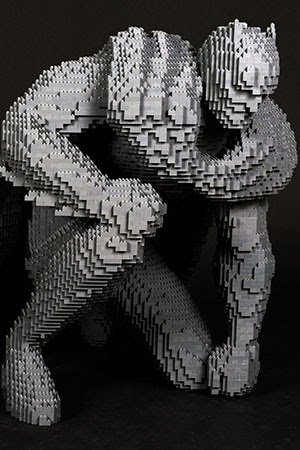 Created by legendary LEGO® artist Nathan Sawaya, this contemporary art exhibition uses hundreds of thousands of bricks to create large-scale sculptures of the most enduring super heroes and super villains: from Batman, Superman and Wonder Woman, to Lex Luthor, The Joker and Harley Quinn. It will be the world’s largest collection of DC Comics-inspired LEGO artwork, ever! Through a series of galleries, The Art of the Brick: DC Comics will showcase Sawaya’s interpretations on characters, vehicles, environments and themes found throughout the DC Comics mythology including transformation and reinvention, strength and weakness, as well as good vs. evil. Get ready to inspire the hero within, this must-see exhibition opens 21 November 2015 for a limited season. Last time I saw a Sawaya exhibition I was a bit disappointed at the liberal use of glue, but remained brickily impressed by the vision and effort involved. You can register now for pre-sale tickets when they become available.